Imagine you were standing in the center of a circle 100 meters in radius. How long do you think it would take to leave the circle? Usain Bolt could do it in 10 seconds, but most people could leave the circle in under a minute. After all, it’s just a casual 100 meter stroll and you are out of the circle. But suppose we added a rule that you couldn’t simply walk in a straight line. Suppose after each step you were required to change to a new random direction. Take a step, random direction. Another step, another random direction. You can’t control your direction, all you can do is take a step. Random turn, step, random turn, step, etc. Now how long would it take you to leave the circle? A minute? Ten? This idea of taking each step in a random direction is called a random walk. While it might seem like a pointless game, random walks show up in the real world quite a bit. One of the most common examples is known as brownian motion, where a larger object is hit by lots of smaller particles, such as a pollen grain in water being bounced about by the water molecules. Brownian motion was the first strong evidence that things were made of atoms. Random walks also occur in astrophysics, particularly by photons in the heart of a star. The heat of a star is generated primarily in its core. In the Sun, for example, hydrogen ions are fused together into helium ions, photons and neutrinos. 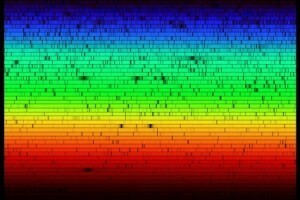 Neutrinos don’t react strongly with the ions in the Sun’s core. The chance of a neutrino colliding with an ion is extremely small. So the neutrinos leave the core at just under the speed of light, and reach the surface of the Sun a couple seconds after they’re born. But photons interact quite strongly with the ions. Even though they travel at the speed of light, the core is so thick with ions that they almost immediately collide with one. On average, a photon in the Sun’s core will travel less than a centimeter before colliding with an ion. It is then scattered in an almost random direction. Imagine a photon trying to leave the Sun, but getting bounced in a random direction every centimeter. You can begin to see that it will take the photon a bit longer than a couple seconds to leave the Sun. On average it actually takes tens of thousands of years. Most estimates put the average between about 20,000 to 150,000 years. For a purely random walk the answer just depends on the length of each step. 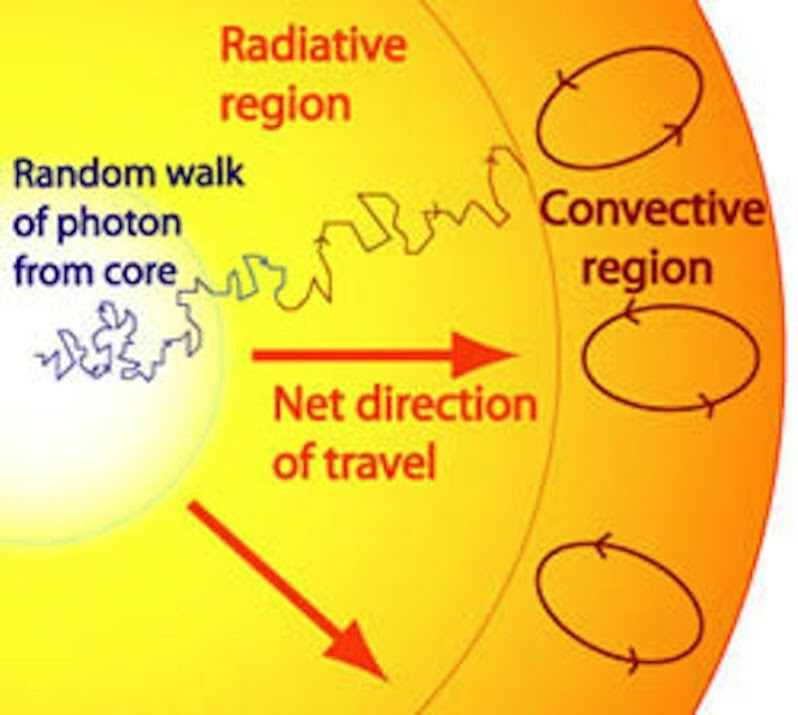 But in the Sun’s core a photon’s path is not quite a random walk. For one thing, the density decreases as you move from the Sun’s core to its outer layers. This means the path length increases as the photon moves away from the core. It also means there is a slight bias, where the photon is a bit more likely to be scattered away from the core than toward it. When a photon makes it about two thirds of the way to the Sun’s surface, it enters what is known as the convection zone. In this region, the solar material cycles up to the surface and back again, which means that the photons can move with the ions to reach the surface. Of course then it takes 8 minutes to travel from the surface of the Sun to the surface of Earth. So the next time you are outside on a sunny day, remember that the warmth you feel on your face was generated by fusion in the Sun’s core. And it has made a very long journey to make your day a bit brighter. Some things in life are so random. Very, very cool! Thanks for that. Interesting article, as always, Brian! All this leads me to the conclusion, that after ignition of a protostar no one can see it’s light for thousands of years and we can only perceive such a star by measuring huge and constant emission of neutrinos. Is it so? There is a delay between the time the light forms and the time it leaves the surface, yes. We don’t have the ability to detect neutrinos from a specific protostar yet. So, do stars burst into existence? Or do they start as a glimmer and gradually brighten to their full potential? I ask because if photons take anywhere from 20,000 to 150,000 years then only a fraction of the first photons created in a new star would reach the surface at same time. The remaining photons could bounce around for thousands, tens of thousands and/or hundreds of thousands of years. In a previous article about Big Bang theory, you mention that hydrogen/helium becomes transparent to light below 3000K. I searched for something about this but drew a blank. Can you explain? Above that temperature, hydrogen and helium gas ionizes, which scatters the light a lot. Cooler hydrogen and helium is rather transparent for a lot of wavelengths.